The move came just hours after US-led coalition air strikes intended to pressure the militants targeted the area on the banks of the Euphrates River. At least 36 trucks and two buses were seen leaving the area through a humanitarian corridor from the militants' last patch of territory in the remote village of Baghouz near the Iraqi border. They were escorted by gun-mounted trucks belonging to the US-backed Syrian Democratic Forces (SDF). As the convoy passed, automatic machine gun fire could be heard in the distance and coalition aircraft flew overhead. 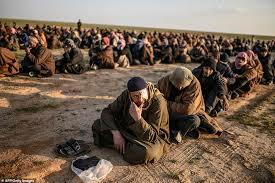 Some 300 IS militants, along with hundreds of civilians believed to be mostly their families, have been under siege for more than a week in the tent camp in Baghouz.